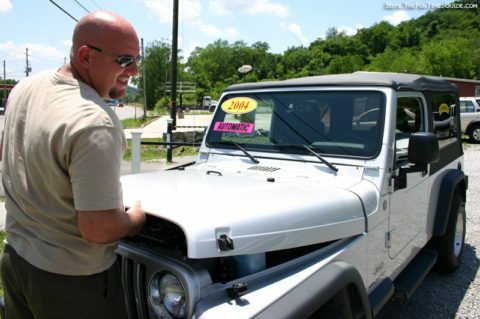 Ever since the day we got it, Jim has been wanting to add some lift to our ’04 Jeep Wrangler Unlimited. Not much, just enough to give us a little breathing room offroad and allow us to put some bigger tires on the Jeep. Of course Jim says he’s doing it mostly for the better ground clearance off-road. But we all know he’s got a soft spot for beefier tires and hot wheels — whether they ever go offroad or not! Initially, Jim wanted a 4-inch lift. But I thought that was too much for a Jeep that is more of a daily driver than an offroad monster. So we settled on a 3-inch lift kit that the guy at 4WheelParts recommended — before he even knew I felt so strongly against a 4-inch lift. He pointed out that they’ve got this one complete kit that includes everything you need and it’s reasonably priced. Plus, he said it’s truly a great set-up… one of their most popular. The best part to us is the fact that 3 inches really isn’t much, yet it’s just enough to serve our purpose — both offroad and on. And it doesn’t require any extensive modifications to the vehicle — there are no drive line issues, no brake line issues, and things like that. More about the basics of lift kits and the factors you should consider before installing a lift kit on your Jeep. Handles — We didn’t actually decide to get these yet, but I’m thinking I may need a little help getting in and out of the Jeep with the new lift kit. I can barely get in the Jeep (gracefully) now — without a step, even though our Jeep has one — so any higher off the ground and I’m pretty sure I’m gonna appreciate having something to tug on. Steps — either running boards, step rails & nerf bars, or steps.